Welcome to another addition of the Hobbit Hollow Construction Blog! Glad you could make it. So off we’ll go! So for starters I’ll just quickly explain my weekend situation. Problem 1:Terence had a Friday night football game in Eldred, New York. Problem 2: It’s Columbus Day Weekend. (Ever try getting out of NYC on a holiday weekend?). Problem 3: Eldred, NY is 90 miles from my house and also 90 miles from NYC. Problem 4: I picked up an Italian Combo sandwich at a deli that doesn’t do Italian combo’s well. Hmmm…..That’s a lot of issues brewing. The game started at 7:15 so I thought I would have plenty of time to get there. So as I’m studying my map (I’m a map guy) a friend of mine asks me what I’m doing before I leave work. He opens up his smart phone GPS and plugs in my destination and then he says, “You better get going it’s going to take you 3 and a half hours to get there.” WHAT!!!!! I grab my Italian combo and get to my car. Like getting to my car 30 seconds faster was going to make a difference. It didn’t. I spent the next 35 minutes going the half mile through the Lincoln Tunnel and eating half an Italian combo while I drove. (It’s illegal to drive and eat an Italian combo while driving in New Jersey…..so I had to finish it before I got through the tunnel. )3 hours to go and my belly isn’t feeling the way is should. (I threw the other half of that Italian combo out somewhere in Northwestern New Jersey) It’s as if the sandwich gods are out to get me ever since I made fun of that lettuce sandwich I got at Jimmy Johns. Me and my big mouth. Well to make a long story short I got to Eldred in time to witness the Pawling Tigers win their first game. Very good for morale. They went into half time trailing 18-14 and then came back strong in the second half winning 40-18. We got home around midnight though so Saturday was a half day for me at the Hobbit House. We got quite a bit done though and I should be able to finish stripping the ceiling on Monday. I had Terence and his friend Peter finish loading up the dumpster. They worked for two hours and put a real dent in all the little stuff. I have another dumpster coming Monday so we can finish the cleanup and move onto bigger and better things. 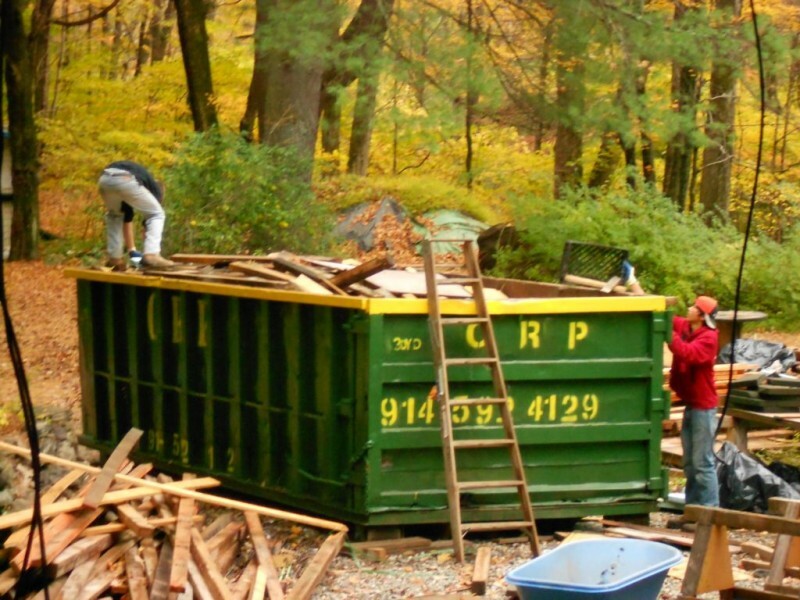 Here they are loading the dumpster. Terence and Peter loading the dumpster. So while they were loading the dumpster I kept going with stripping the ceiling. Moving along nicely, I might add. I’ve uncovered all of the skylights and only have three rows of plywood to pull down. 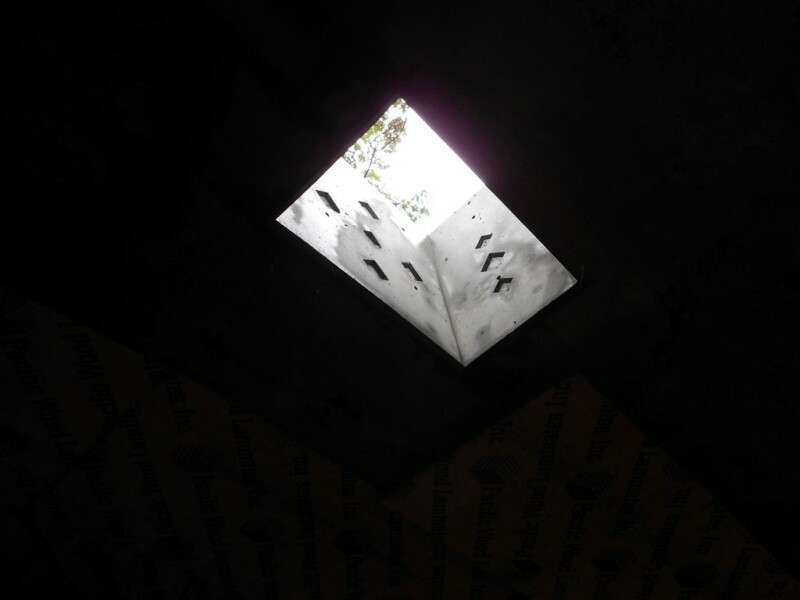 Here’s a picture of the skylight that’s in the hallway. Had a little trouble with the dreaded Northeast corner but stayed to complete that portion. So we are now poised to finish the ceiling Monday. May the Hobbit House gods be with us. Like I said it’s Columbus day weekend and Sunday was scheduled to be a beautiful day. 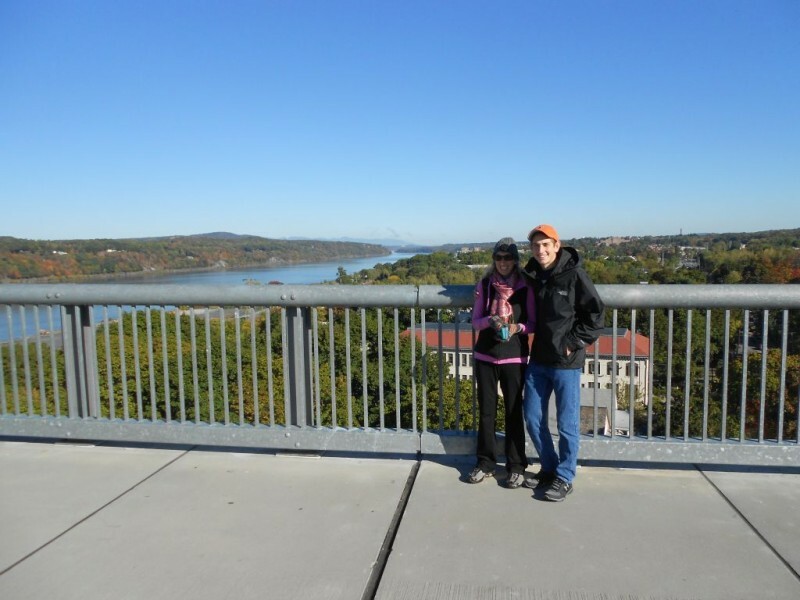 The Editor came up with the brilliant idea of going on the Hudson Valley River walk. What a great idea! The river walk is actually the first railroad bridge that was ever built over the Hudson River. They refurbished it and made it into a walking bridge. A great vision that was just completed a few years back. 1.3 miles to cross the bridge. Check out these views. Looking North. Jodi and Terence. 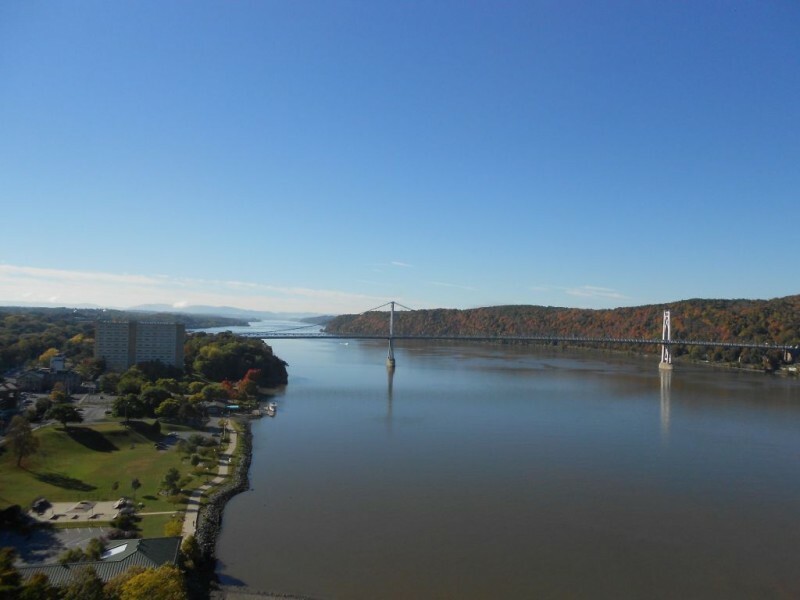 View of the Mid Hudson Bridge looking south. We’re way up there aren’t we! When you come and stay at the Hobbit House we’ll have a long list of things to do and places to see. There really is so much in the Hudson Valley that’s nearby. Just a quick update this week but things are really going to start happening soon…once we finish form removal. Enjoy your Columbus Day and I’ll see you next week! Pete! How’s the new job going? Nice to see you keeping up with the blog. Yes, keep it secret, keep it safe. Pretty cool idea. Might make a good house warming gift when I christen the Hobbit House. Thanks for writing and thanks for looking out! Take it easy and I hope things are going your way!